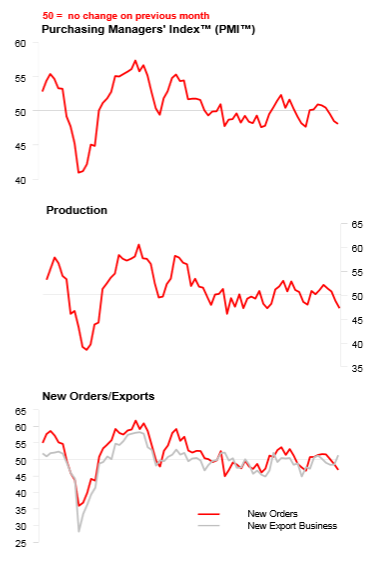 The HSBC Flash China Manufacturing PMI shows Output Contracts at Quickest Pace in 18 Months. 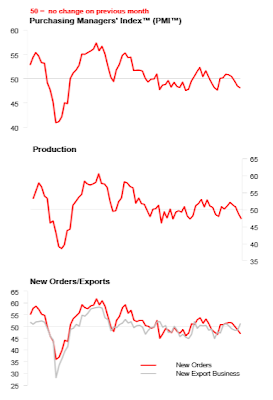 The overall PMI index, new orders, and production were all lower. Flash China Manufacturing PMI™ at 48.1 in March (48.5 in February). Eight-month low. Flash China Manufacturing Output Index at 47.3 in March (48.8 in February). Eighteen-month low. In the face of an explosion of credit, still growing imbalances, malinvestments, property and other bubbles, it is a mystery why anyone expects China to make efforts to “stabilize growth”. To stabilize growth implies more bad loans and more SOE malinvestment. Given China’s massive housing vacancies, support for still more housing is ridiculous. More malinvestment is possible of course, but the longer China attempts to keep the credit party going, the worse the ultimate implosion.